much more notable than either you or me. With anything that mattered, he was associated. His social calendar was full. Its pace never abated. he always made an effort to be there, front and center. in every newspaper column. In every magazine. standing at the back of lines became his final fate. In heaven, every denizen is considered notable! The prompt words today were anything, integral and effort. This entry was posted in Famous People, Uncategorized and tagged FOWC, notoriety, poem about being famous, RDP, Word of the Day on February 2, 2019 by lifelessons. A railroad linking America’s east and west coasts had been a dream almost since the steam locomotive made its first appearance in the early 1830s. The need for such a link was dramatized by the discovery of gold in California in 1848 that brought thousands to the West Coast. At that time only two routes to the West were available: by wagon across the plains or by ship around South America. Traveling either of these could take four months or more to complete. Although everyone thought a transcontinental railroad was a good idea, deep disagreement arose over its path. The Northern states favored a northern route while the Southern states pushed for a southern route. This log jam was broken in 1861 with the secession of the Southern states from the Union that allowed Congress to select a route running through Nebraska to California. Progress was slow initially, but the pace quickened with the end of the Civil War. Finally the two sets of railroad tracks were joined and the continent united with elaborate ceremony at Promontory, Utah on May 10, 1869. The impact was immediate and dramatic. Travel time between America’s east and west coasts was reduced from months to less than a week. The ceremony at Promontory culminated with Governor Stanford of California (representing the Central Pacific Railroad) and Thomas Durant (president of the Union Pacific Railroad) taking turns pounding a Golden Spike into the final tie that united the railroad’s east and west sections. As the spike was struck, telegraph signals simultaneously alerted San Francisco and New York City, igniting a celebratory cacophony of tolling bells and cannon fire in each city. It will probably come as no surprise that in 1969 it was decided to have a huge ceremony honoring the 100th anniversary of the “Wedding of the Rails” in Utah. To that end, two trains set out—one from the easternmost point of the track and the other from the westernmost point. These trains were destined to meet at the original point of their joining, but since they were filled with dignitaries, they made numerous stops along the way with celebrations at each point where they stopped. In 1969, I was attending university in Laramie, Wyoming. It was announced that John Wayne and Glen Campbell would be on one of the trains and that they would do a whistle stop where they would both say a few words before continuing on to the ceremony. Now it just so happened that this event coincided with Sigma Chi Derby Days—an annual event that consisted of a number of challenges whereby campus groups could assemble points. 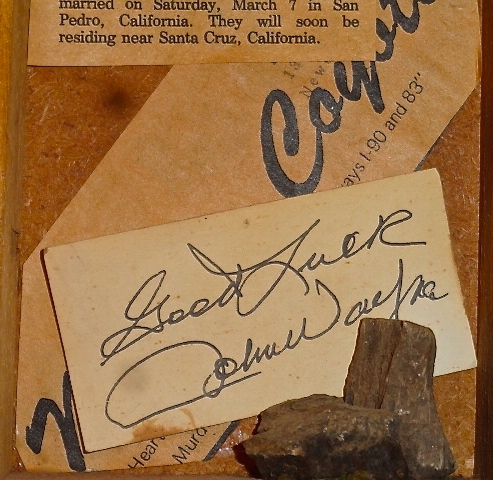 What the prize was I can’t remember, but I do remember that one of the contests was to gain the signature of the most famous person, and I happened to know that John Wayne himself had been a Sigma Chi. If I could somehow gain his signature, we would have it made in the shade for that particular challenge. And so on the prescribed day, we were off, fully laden, with five of us filling the seats of my little red Ford Galaxy. How we would get close enough to the train to gain the autograph, I did not know, but nothing ventured, nothing gained. There was, as may be expected, a huge crowd at the Laramie train station, and we waited in anticipation for the train. Finally, it came up, sounding its whistle, flags waving. Several men came out to a small stage that had been constructed just in front of the train. Finally, Glen Campbell came out, but no John Wayne. We were puzzled when the speeches started without him. What could have happened to John Wayne? Finally, I was hit with one of those instant inspirations often depicted by a light bulb going off over someone’s head in cartoon bubbles. “I bet he got off the train to fly back to California!” No one disagreed and it was my car, so off we sped to the airport, which was several miles outside of town. We drove well over the speed limit down the two-lane nearly carless road. As we approached the airport, we could see no larger planes loading, but there was one smaller private plane. We went speeding up to the airport. “I’ll go see what’s going on with that small plane,” I told my friends, springing from the door almost as soon as the car had come to a screeching halt. I went running out onto the field—not hard to do in a small airport in those years before airport security­—and ran smack dab into a man who was walking toward the plane from the opposite direction. “Well, whoa, there, little lady. Where ya goin?” said the brick wall I’d just run into. “I’m trying to find John Wayne. Do you know if he might be in that plane?” I asked. I looked up—way up—and sure enough. There he was with his hands still on my forearms where he had caught me just before I ran into him broadside! Long story short, John Wayne did not come back to campus with us. His manager managed to persuade him it was not in his best interests given that something in California was important enough to warrant his immediate return. But, I did get his signature and no, I did not turn it in for Sigma Chi Derby Days. 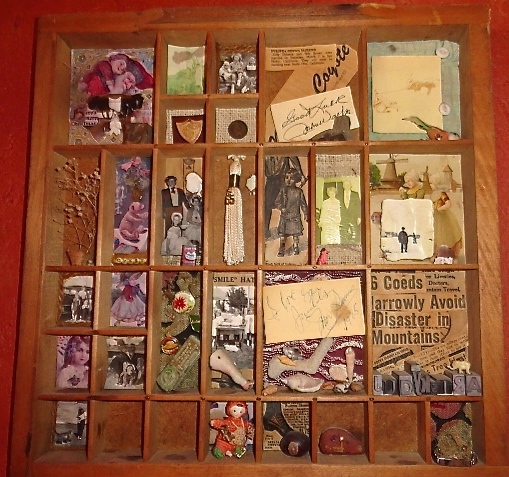 To this day, it resides in a square of a memory box—one of the kind popular in the sixties and seventies that is made out of an old newspaper print box—and as proof, I include a picture below. The Prompt: What’s the most surreal experience you’ve ever had? Submitted on 2015/03/21 at 11:26 AM | In reply to Anton Wills-Eve. This seems to be a day for synchronicities. Did you read Mark Aldrich’s piece? Today is also my best friend’s birthday and I need to call her as well. Your mentioning your birthday reminded me of hers, so the chain goes on. Thanks for your kind words, Anton. I wonder why that did not ping properly. That is a treasure of a story. This entry was posted in Famous People, memories, movie stars and tagged College, College memories, college stories, Daily Post, Daily Prompt, Famous people, how I met John Wayne, John Wayne, judy dykstra-brown essay, Judy Dykstra-Brown Photos, Judy Dykstra-Brown stories, meeting famous people, memories, movie stars, Union Pacific Railroad on March 21, 2015 by lifelessons.